Preheat the oven to 400 degrees F and line a baking sheet with parchment paper.In a mixing bowl, stir together the flour, baking powder, shredded coconut, coconut sugar, and salt (dry ingredients).In a separate small bowl, whisk together the coconut oil, coconut milk, and vanilla extract (wet ingredients). 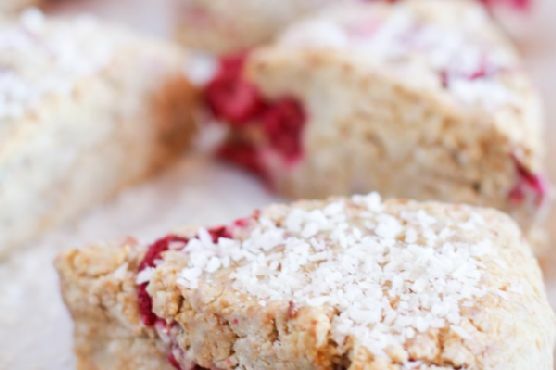 Pour the wet mixture into the bowl with the dry mixture, and stir until a dough is formed.Carefully fold in the raspberries.Turn the scone dough out onto the parchement-lined baking sheet and form it into a ball.Press it into a round disc about 2 to 3 inches thick. Cut triangles using a knife, making 8 equal-sized scones.Evenly space the scones on the baking sheet and bake for 18 to 22 minutes, until browned.Allow scones to cool at least 10 minutes before serving with butter and honey. Scone on the menu? Try pairing with Cream Sherry, Moscato d'Asti, and Port. A common wine pairing rule is to make sure your wine is sweeter than your food. Delicate desserts go well with Moscato d'Asti, nutty desserts with cream sherry, and caramel or chocolate desserts pair well with port.